Sorry this week's ten minute fix is late. I was getting over a bad case of food poisoning (not that there's a good case of food poisoning). Also, don't forget to tune in Thursday for the very first My Life interview with Cecilia! Once upon a time, I was a freshman in college and I thought it would be funny to open up my journal and write about tomorrow rather than today. So, I said I would ace my math test and a girl would come over and ask me to Homecoming. I wanted both things to happen, but didn’t believe either was possible. The next day, I bombed my math test, but there was a knock at the door. There standing in front of me were two girls from the neighboring building. I assumed they came over to see my roommate Steve (all the girls dug Steve) but no! One of them came over to invite me to go to Homecoming with her! Crazy! Someone must have read my journal and set the whole thing up, because there is just no way the fates would have been so kind to me. Since this experience, I’ve thought a lot about “pre-journal writing”. It’s really just a way to plan your day, set goals, and think optimistically. Not everything happens as planned, but some things do! And that’s pretty neat. 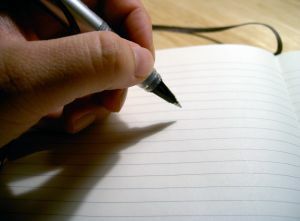 Writing about what you want as if you already had it, is a powerful tool in positive thinking. I won’t go so far as to say your positive thinking is compelling the universe to give you what you want (if you’ve heard of The Secret, you know what I’m talking about), but it does help in some strange way. So, take ten minutes to write about tomorrow. Pretend you’ve just had the perfect day and now you want to write it down so you can remember it forever. Be as unrealistic as you want. Just have fun with it and you may be surprised by the results. The point isn’t to predict the future, so don’t worry if not everything comes true. The point is to envision how you want your life to be and feel optimistic about the coming day. Pre-writing is SO helpful. I've done this on a monthly basis for the past 5 years and I'm fairly confident that it has been the thing that has kept me on track. having not only a plan but a VISION of the future is super important. I like to focus on general personal values (patience, optimism etc...) but in very specific situations. That way- when I find myself in that situation- a little red flag goes up in my brain and I am extra careful about how I choose to handle things.